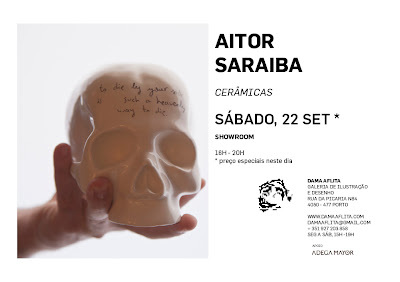 Aitor Saraiba é licenciado em Belas Artes pela Universidade de Cuenca. Sempre gostou de pintar e de contar histórias. 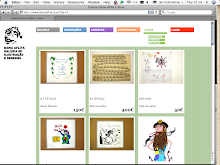 Até agora tem produzido pequenas e grandes publicações, publicado online, exposto em galerias como Mad is Mad, galeria Fúcares e La Fresh Gallery, entre outras. Também colaborou com projectos para Noche en Blanco, festival de Madrid, Musac e o Museu de Arte Thyssen. O seu segundo livro “Pajarillo” estará disponível nas lojas este Outono. O seu primeiro livro “El Hijo del Legionario” está já disponível para venda. Gosta de heavy metal e Nicanor Parra. A vida ensinou-o a não ter residência fixa. Aitor Saraiba graduated in fine art in Cuenca. He as always loved painting and telling stories. So far he’s done this through small and big publications and desktop publishing, and in his exhibits at Mad is Mad, Galería Fúcares and La Fresh Gallery, amongst others. He also collaborated with projects for the Noche en Blanco festival in Madrid, MUSAC and the Thyssen Art Museum. His second book "Pajarillo" will be in stores this fall. His first book "El hijo del legionario" is already on sale. He likes heavy metal and Nicanor Parra. Life has taught him that he has no fixed home.